What makes me so damned tragic? But through the tragedy, the poem shows that while Betts is grounded in an African-American identity, uncertain though it is, her vision is truly pan-ethnic, born of a feeling for the “amalgamation improvisation / within Black,” the criss-crossing of blackness with whiteness, with Mexican, Filipino, Puerto Rican, with North and South and the international that reaches to Egypt and beyond. Blackness, then, is as much a process—collaboration, amalgamation, improvisation—as anything else. Such a “collaborationist” ethic shows not only in her writing, but in the way she became one of the most involved artist in Chicago: teaching, conducting workshops, and performing for the Guild Complex, Gallery 37, Young Chicago Authors, Columbia College, Northwestern School of Law, and primary and secondary schools throughout the area. A fixture in Chicago performance poetry, Betts was involved in the “Women Out Loud” series at Chicago’s Mad Bar and has been part of the Mad Bar’s teams in the National Poetry Slam competitions. Betts’ poems have appeared in many publications, including Obsidian III, Mosaic, Rhapsody in Black, Dialogue, Crab Orchard Review, Callaloo, The Columbia Poetry Review and the Tia Chucha press 20th anniversary anthology Power Lines. 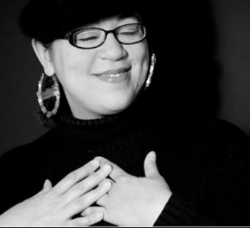 In 2010, Essence magazine named her one of its “40 Favorite Poets,” She received her MFA in Poetry from New England College, residencies and fellowships from the Ragdale Foundation, Centrum and Caldera, and the Illinois Arts Council, and her PhD in English from SUNY Betts. Her poetry books and chapbooks are Can I Hang?, Switch, Break the Habit, and Arc & Hue, and she has been anthologized not only in my Black Writing from Chicago, but also in such books as The Break Beat Poets, and Octavia’s Brood: Science Fiction Stories from Social Justice Movements. In 2011 the Peggy Choy Dance Company commissioned her to write a series of poems and monologues for “THE GREATEST!”: An Homage to Muhammad Ali. She has been a lecturer in creative writing at Rutgers University, though her major passion remains performance. She continues to embody the mixing she celebrates in “A Mixed Message” through performances in Cuba and London, and from coast to coast in the U.S. at venues such as the Arie Crown Theater, The New School, The Museum of Contemporary Art, Studio Museum of Harlem, Lincoln Center for the Performing Arts, The Metro, Cornelia Street Café, Bowery Poetry Club, Nuyorican Poets Cafe, Schomburg Center, Yerba Buena Cultural Center, the Field Museum of Natural History, and Harvard and Yale universities. She has also appeared on HBO’s Def Poetry Jam, and in the Black Family Channel series “SPOKEN” with Jessica Care Moore. ♦ Go to a list of Black Writers and to the Teaching Diversity main page. 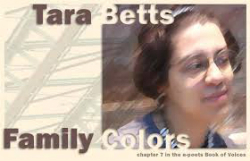 This entry was posted in Black Writers, Chicago Writing and tagged Black Writing from Chicago: In the World-Not of It?, Tara Betts. Bookmark the permalink.